Cali is known as the salsa capital of Colombia, if not the world, and for this reason alone it is a popular place to visit for those with extra time in the country. The city features dozens of dance schools, catering to all skill levels, plus some of the hostels even offer their own group instruction. 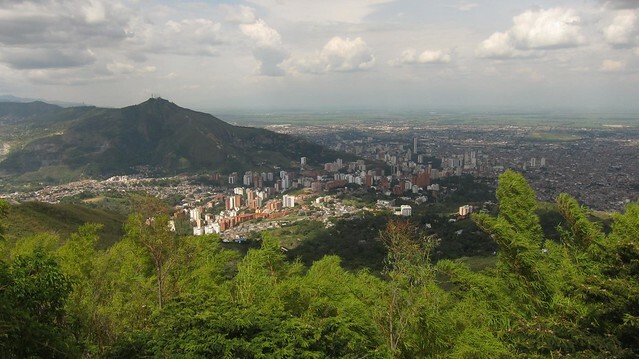 Colombia's third largest city sits at a lower elevation than Bogota or Medellin, meaning temperatures warm up in the Summer, however they still don't get as steamy as the coast. Aside from being an awesome place to party, Cali's restaurant scene is amongst the best in the country. Cali's International Airport Alfonso Bonilla Aragon is located about a 20-minute drive from the city center. Major airlines serving the city include Avianca, American Airlines, Aires, and COPA Colombia. To get to your hostel or hotel from the airport, take a taxi for about 50,000 pesos ($28). Internet Access: No free wi-fi. There may be internet shops open during regular business hours. Cali's Terminal de Transportes offers regional and long range buses to destinations around the country. 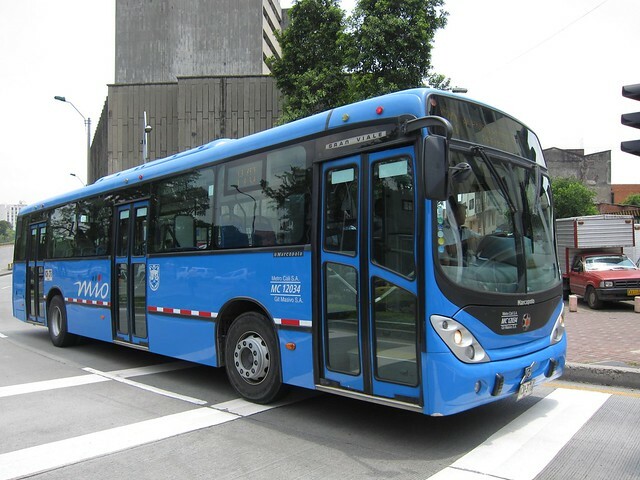 When leaving the city, you can usually show up and find a bus departing within a few hours for wherever you're headed, especially if it's another major city such as Bogota or Medellin. The exception is national holidays, when a larger number of Colombians are traveling around the country. Internet Access: Communications shop with internet access, however it may not be open at night. The Mio buses are Cali's main mass transit system. Taxis are an easy and inexpensive way to get around the city. You can hail them from the street, however it's safer to call a taxi service to have one pick you up. Upon calling, they will give you a code (clave) to confirm with the driver, thereby ensuring you're getting in the right taxi. Be forewarned, sometimes the taxis don't show up, so leave yourself extra time if you're meeting someone at a specific time. Make sure the taxi's meter is on once you get started. Unlike Bogota taxis, the meters in Cali taxi reflect the rate in pesos that you'll have to pay. The exception is if the taxi driver had to wait for an extended time at some point along the trip, in which case he may ask for an additional 1,000 pesos ($0.75). For safety purposes, it's better to sit in the back seat, with the windows rolled up. Do not take valuable possessions out of your pocket, purse or bags while in the taxi. Smartphones are an especially popular target for thieves. Some taxi drivers work together with the thieves, and garner a share of whatever is then stolen from you. Mio is Cali's version of Bogota's Transmilenio bus system. It offers a clean, efficient system of routes throughout the city, and during off-peak hours, will be more comfortable than taking the regular private buses. The cost for a single ride is 1,500 pesos (about $0.90). A plethora of private buses ply the city streets, and can take you just about anywhere you need to go. The bus routes are posted in the front windows, and feature major landmarks, universities and shopping centers to help you get your bearings. Flagging a bus is as easy as holding your hand out as it approaches. To get off the bus, look for a red button on the inside to push, or if you can't find one or it's not working, alert the driver that you want to get off. The average cost of a ride is 1,500 pesos ($0.90). 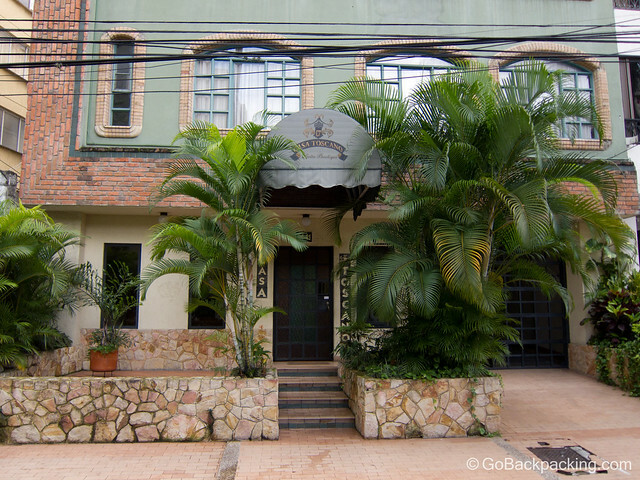 Casa Toscano is centrally located, and within walking distance of La Sexta and barrio San Antonio. The majority of hostels are located around La Sexta, the city's Zona Rosa, and historic barrio San Antonio, which is quieter, and filled with charming restaurants. San Antonio is one of the safer and prettier neighborhoods in the city, however petty crime still occurs as thieves target tourists. Take care when walking around at night. Jovitas Hostel – Calle 4 #5 – 43, barrio San Antonio. A unique benefit to staying at this hostel are the weekly group salsa lessons. You'll enjoy the Cali nightlife more if you learn the basics of this Latin dance. Casa Toscano – Calle 4 Norte #1N – 41, Barrio Centenario. Private rooms with baths and kitchenettes start around 80,000 pesos ($45) per night. Breakfast is included, the wi-fi is strong throughout the hotel, the staff are friendly, and overnight guests are allowed, which is not often the case with hostels. CompartoApto.com offers free listings for rooms and apartments, most of which are offered by Colombians for 300,000 – 600,000 pesos per month ($170 – $340), utilities included. Couchsurfing is another option which can help you save money, and give you a chance to see the city through a resident's perspective. As most Colombians live with their parents until married, it may be hard to find a place to stay, however members of the Cali CS group get together often so it can still be an easy way to meet the locals. The Cristo Rey (Christ the King) statue is perched atop a mountain overlooking the city. Most visitors focus on salsa dancing in Cali, however there are a few noteworthy points of interest that can help round out your experience during the day. 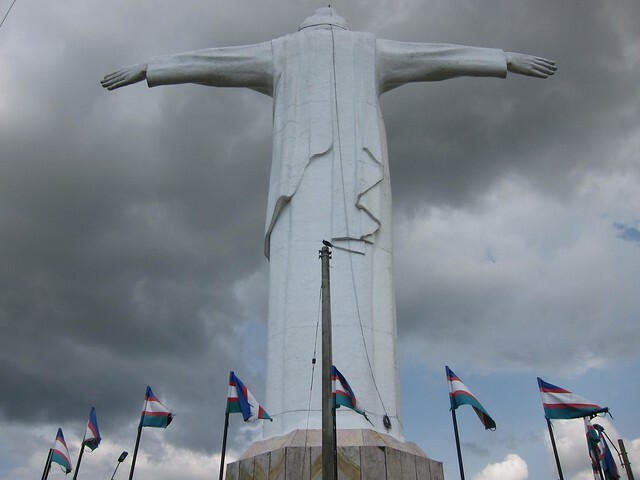 Cristo Rey – A statue of Christ the King sits high upon a mountain overlooking the city. Take a taxi during the day to get sweeping views of the city. The area around the statue is known for thieves, so try not to go alone. Cerro de las Tres Cruces – The mountain of 3 crosses also offers good views of the city, and can be hiked up for those looking to exert themselves. Zoologico de Cali – The Cali zoo is the best in the country, and features a wide array of indigenous animals, as well as lions and a giant tiger. Admission is only a few dollars, and it's worth spending a few hours here. Historic churches and parks – Spend a morning walking around the downtown area (centro) to get a real feel for the city. Popular points of interest include the gothic-style La Ermita church and Parque de los Poetas. Barrio San Antonio – Colorfully painted restaurants, cafes, shops and hostels line the narrow streets of this historic, hilltop neighborhood. Walk up the hill to Iglesia de San Antonio, a church, for nice views of the city. The surrounding park is a popular gathering place for locals every Sunday night. San Cipriano – This small pueblo about an hour by bus outside of Cali gets rave reviews from travelers. The most popular thing to do is rent an inner tube and float down the river. 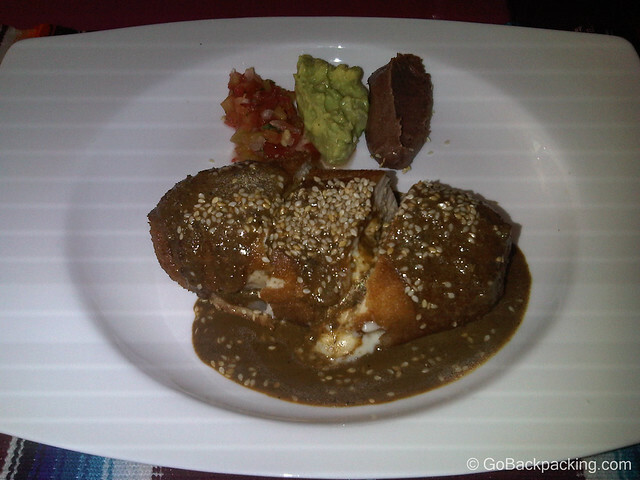 Chicken in a mole sauce at Rosa Mezcal. Cali's food scene is excellent, and you can find terrific restaurants by simply walking around barrio Grenada or San Antonio. A large concentration of restaurants are also focused around Parque de los Perros. The city's proximity to the Pacific Ocean also ensure fresh seafood is widely available. Sancocho de gallina – Popular soup made of chicken, corn, plantain, and a variety of seasonings. Bourbon Street – Calle 17 Norte #8N – 45, barrio San Antonio. New Orleans themed restaurant serving up typical American food. Popular with expats. Passion Restaurante – Calle 14 Norte # 9N – 04, barrio Grenada. Beautifully presented seafood, pastas, and more are available at this upscale restaurant. Rosa Mezcal – Calle 2 #4 – 63B, barrio San Antonio. Excellent Mexican food. Teatro Magico del Sabor – Calle 4 #10 – 30, barrio San Antonio. This restaurant focus on more than just preparing Colombian food, the chef also puts on a show in his open air kitchen as he cooks. Salsa dancing at Tin Tin Deo. Colombian nightlife has a great reputation, especially within the big cities, and Cali is no exception. The city's Zona Rosa, or main nightlife district, is La Sexta (Avenida 6). If you're staying in a nearby hostel, it's a short walk, otherwise hop in taxi. To gauge which clubs are hot at any given time, check out the ones being featured regularly on Pegateya. Chango – Km 3 Via a Cavasa, barrio Juanchito. Historic salsa bar in the northeastern part of town. 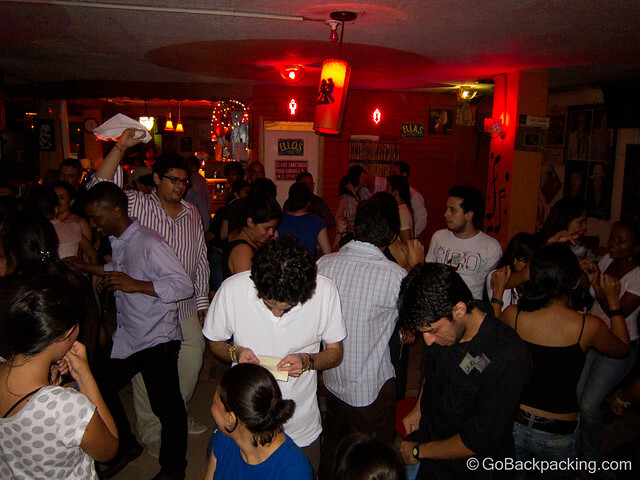 La Sexta (Zona Rosa) – Just walk down the main avenue until you find a bar or discoteca that looks like fun. Most will not start to fill up until 10 or 11 PM, Thursday, Friday, and Saturday nights. Menga – After you've had fun on La Sexta, catch a cab 15 minutes further north to barrio Menga which has a strip of late night discotecas that remain open until 4 AM. Tin Tin Deo – Calle 5 #38 – 71, Barrio San Fernando. Old school salsa bar that remains extremely popular with both Colombians and expats, especially on the weekends. Zaperoco – Avenida 5N #16 – 46, one block off La Sexta. Popular salsa bar featuring live bands Thursday nights.